Have you ever considered how universal salad is? It’s a global phenomenon! Think about it, almost every culture in every country across world has their own version of salad from lettuce, to fruit, to grains, cooked or uncooked. Practically every food on the planet can be used to create this global dish. One of my lifelong friends, Laurie Kerkinni, created this salad. It includes a mix of arugula and leaf lettuce, marinated mushrooms, avocado, garlic and goat cheese. Toss this salad with a balsamic and honey dressing. The beauty is you can substitute any of these ingredients with what you have on hand to make it your own creation or follow my recipe for a brand new mouthwatering salad experience. 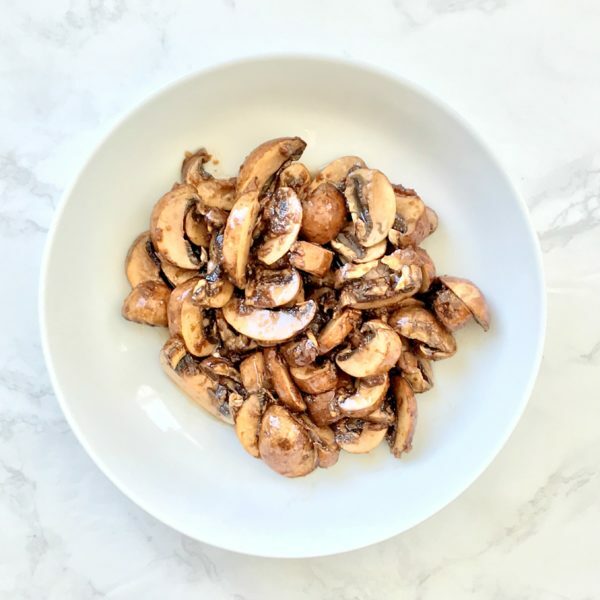 What I find unique about this salad are the intense flavors that permeate the mushrooms as they marinate. A combination of garlic, fresh ginger, and Tamari create a warm almost zesty flavor built into this edible fungus that sets the stage for a unique salad experience. 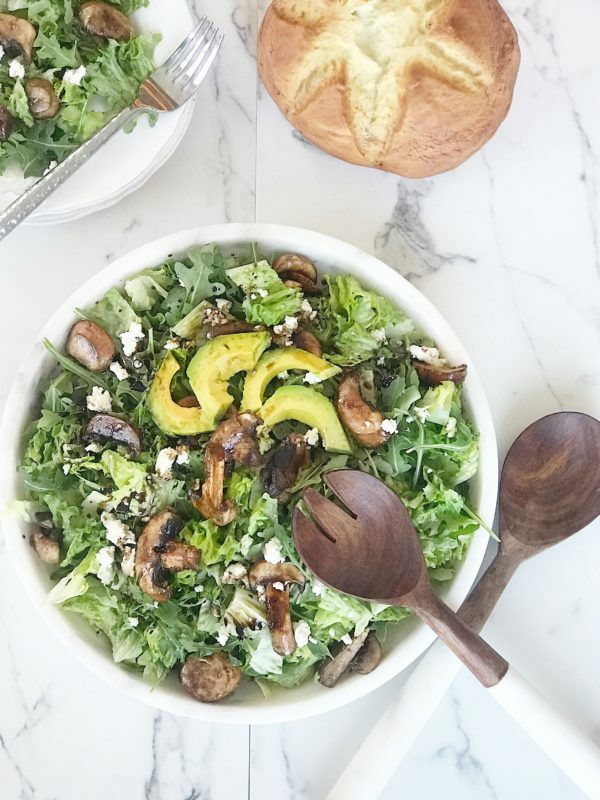 The combination of peppery arugula, fresh mixed greens, creamy goat or Boursin cheese and buttery avocados paired with the marinated mushrooms create a symphony of flavors, unlike any you have tried. While the list of salad ideas are endless between cultures and continents, this is one recipe that sets itself apart from anything you may have tasted before. I hope you enjoy it as much as I do! 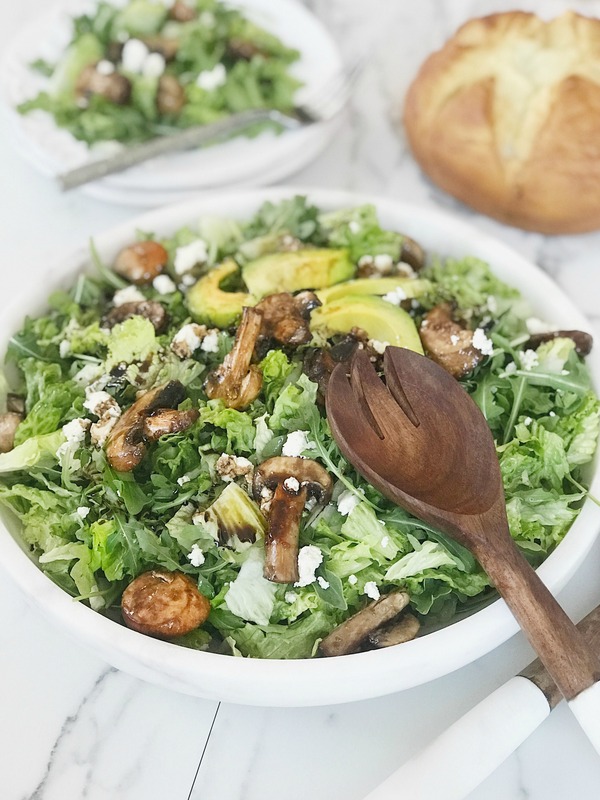 This Tamari Ginger Mushrooms Salad bursts with the essence of ginger, garlic, and Tamari marinated mushrooms tossed into a bed of mixed greens and garnished with flavorful Boursin cheese and avocados. Beginning with dressing, bring balsamic dressing and honey to a boil over medium-high heat. Reduce heat to low and simmer 10-minutes or until liquid reduces and begins to thicken. Remove from heat and let cool. In a medium bowl, whisk together Tamari, garlic, ginger, and olive oil until combined. Add in mushrooms and coat completely with sauce. Marinade for 30 minutes or more, coating the mushrooms with sauce as it marinates. Just before serving, toss together mixed greens and arugula in a large bowl. Gently sprinkle mushrooms over lettuce, making sure to layer them through the lettuce evenly. Spoon the desired amount of dressing over the lettuce and gently toss to coat. Transfer the salad to a large serving bowl or platter. Top the salad with avocado and Boursin cheese. Serve immediately. Make sure the dressing has cooled completely before adding it to the lettuce. If it is still warm, the salad will become wilted and soggy.